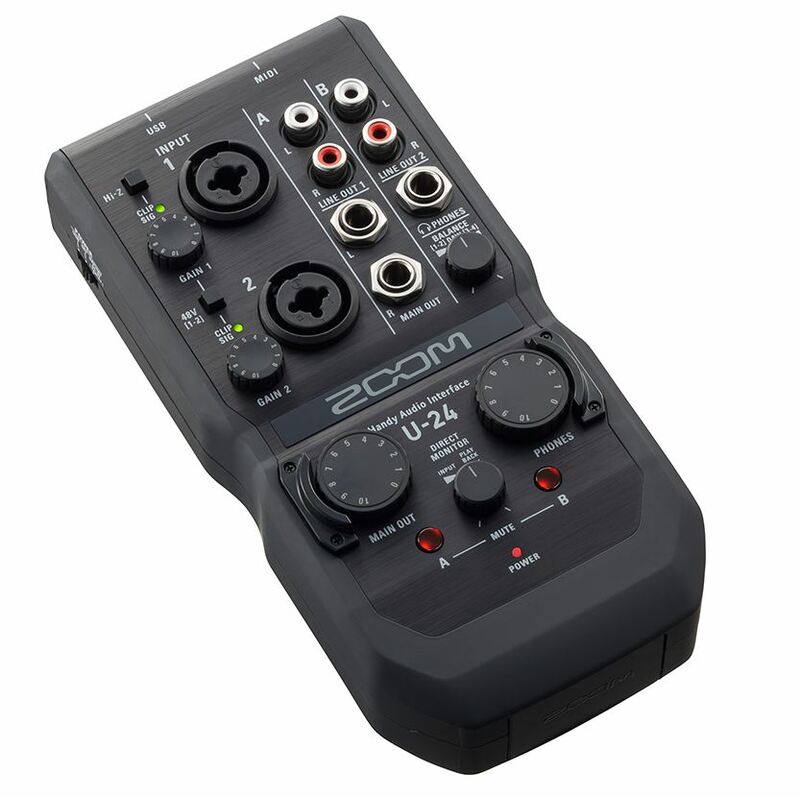 Zoom U-24 is a 2-in/4-out, 24-bit/96 kHz audio interface. It is a good choice for musicians, producers, DJs, sound designers and composers who need a compact and versatile audio interface. The product is equipped with high-quality, low noise preamps (the same ones found on H5 and H6 Recorders), and can be connected to PC, Mac or iOS devices. The top panel has two combo XLR/TRS inputs, with independent gain controls and a LED clipping indicator. Input 1 has a Hi-Z switch, so the user can plug a high impedance instrument, such as an electric guitar. Input 2 has a +48V phantom power switch so that the user can connect a condenser microphone. 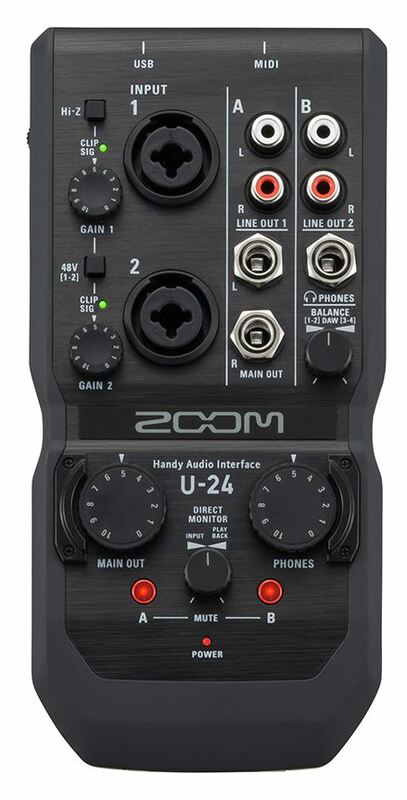 U-24 has two large knobs: one for the Main Output control and the other for Phones gain. The product also has a Direct Monitor knob and it’s possible to adjust input and playback levels accordingly. Each input has a mute switch. The output section has Main Out 1 and 2 TRS jacks and TRS output Phones. There are also two Line outputs. Line Output 1 will receive the signal from the Main outputs, while Line Out 2 will receive Phones signal. 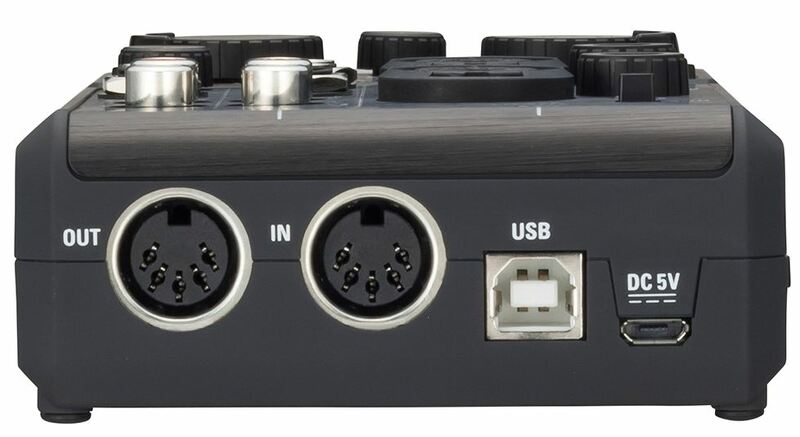 The back panel has 5-pin Midi In/Out jacks, a USB port and a DC 5V connector (power adapter not included). It’s possible to connect U-24 to a Mac or PC and even to iOS devices, such as iPhone or iPad, using Apple iPad Camera Connection Kit or Lightning to USB Camera Adapter (not included). The side panel has a power switch, where it’s possible to choose from USB or battery for power supply. The product uses just two AA batteries to be powered (approximately 4 hours of operation). – Ableton Live 9 Lite included.